There is so much to learn about varying lead grades, and shading techniques. I have outlined some useful info and tips below! A pencil set with many different grades or just a single pencil with a versatile grade (usually 2B) will both work very well when shading. It's really all up to you! The 20 most common grades of lead are 9B through 9H. The letters and numbers indicate the type of lead that it is. H stand for hard, and the B stand for black, or bold. When a lead is hard it leaves a very light amount of lead on the paper, so you want to use a hard lead when you want a light shading. Usually hard lead is not used for portrait drawings, 9B through HB are what is used most for portrait drawings. The black, or bold lead grades are a soft lead, leaving a lot of lead on the paper and produces dark shades. There is also an F grade, and this stands for fine point. This type of lead is still fairly hard, but has a more pronounced and sharpened point. The HB lead grade is the middle ground between hard and soft. The technique of blending is when you mix two shades together. You want the shades to naturally flow into one another so it creates a realistic feel and not a dramatic one. 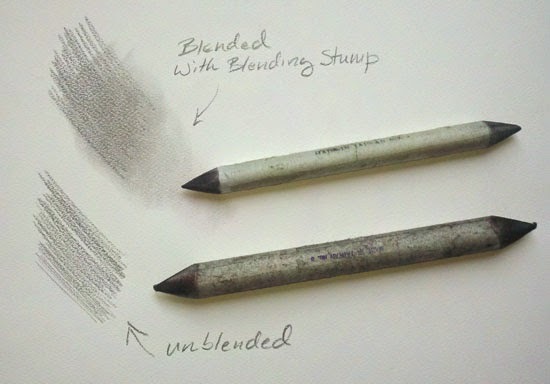 To blend pencil lead you will need to use a tortillion or blending stump. Some people choose to use their fingers, however since your fingers have oils sometimes the lead will stick to them and won't create the desired effect you are looking for. When blending with pencil it helps to move in a small circular motion, this allows the shading to look very smooth. It is also important when shading to go from dark to light. And the best tip of all, have patience! It can take some time to create your desired effect.